Interns at IT Innovation have the opportunity to work on a diverse range of challenging problems, supporting organisations such as Disney, The British Museum and the Barcelona City Council, working on collaborative research, development and innovation projects with other academic and industrial organisations such as IBM and Atos. 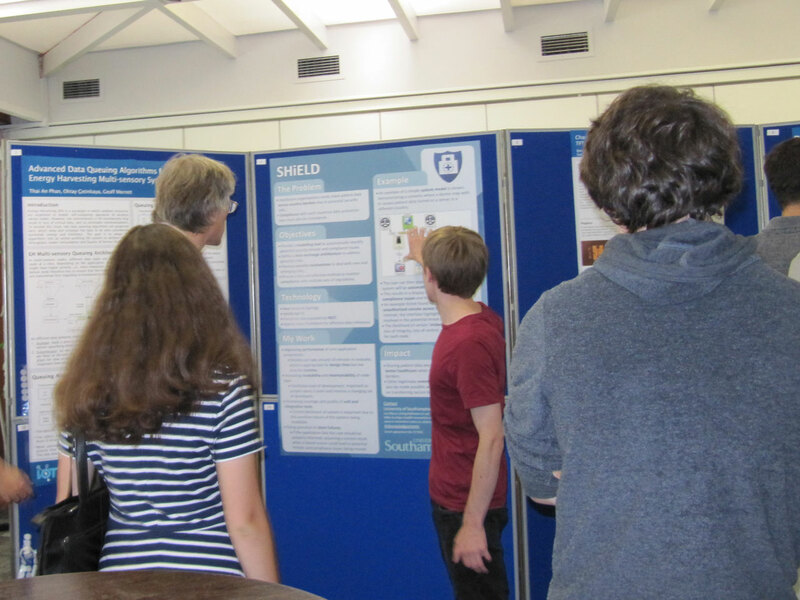 In August 2018, eight interns from IT Innovation showcased their work at the ECS Intern Festival at the University of Southampton. This is an annual event where interns have the opportunity to gain experience in presenting their work and learn about future opportunities. 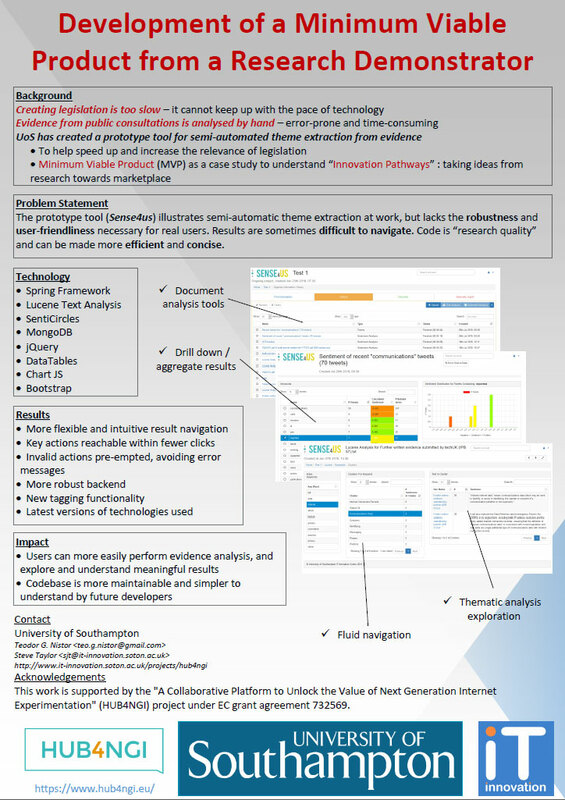 The interns have worked on a range of software engineering, security and data science problems in six European collaborative Research & Innovation projects. The interns have real opportunities for making a difference in our projects, for instance helping to provide reliable platforms for our research, contributing to research on data protection in cross-border exchanges and in the Cloud, and applying intelligent algorithms for risk prediction, object identification, and natural language processing. 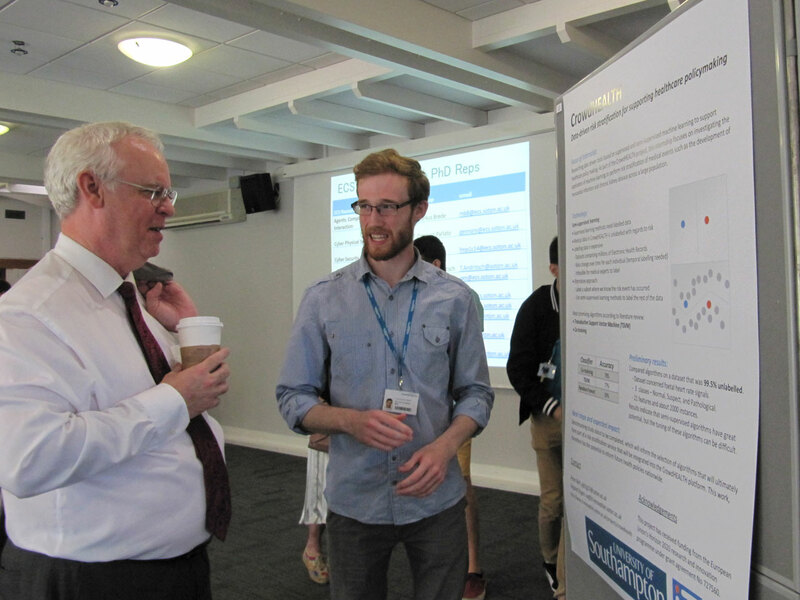 After showcasing their work at the ECS Intern Festival, Peter Bell said: "It was a good opportunity to practice presenting my work in CrowdHEALTH. It was really useful to have an event like this to work towards as it pushes you to really understand the work you’re doing and the context of it, so you can clearly explain it to others. It was also great to learn about the range of other fascinating projects. An enjoyable day!" 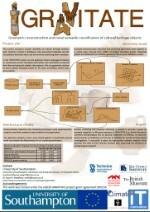 Posters and a description of the interns' work is available below. 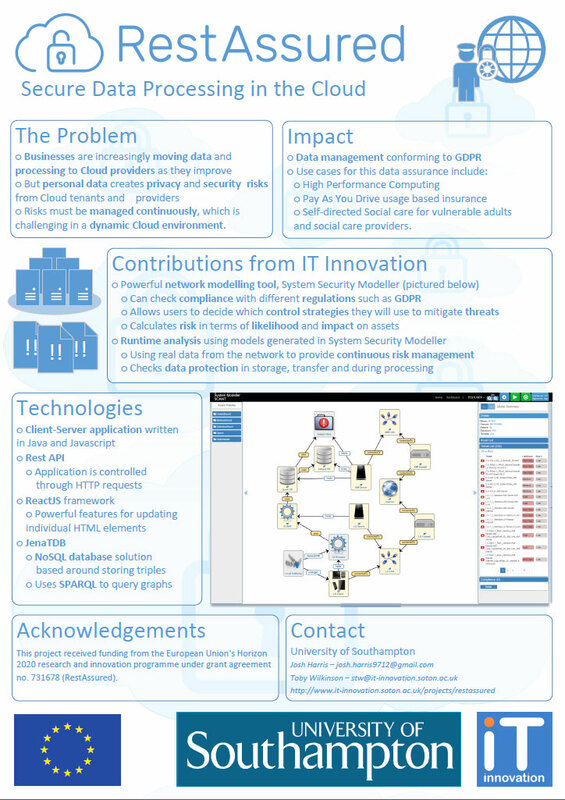 An overview of the SHiELD project outlining the problem domain, the high level objectives of the project, and the impact the completed project will have. 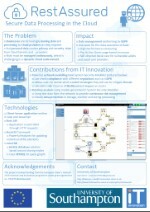 An example use case of the project is included, as well as an outline of my work as an intern on improving application performance, error handling and testing. 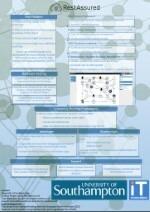 Researching data driven tools based on supervised and semi-supervised machine learning to support healthcare policy making. 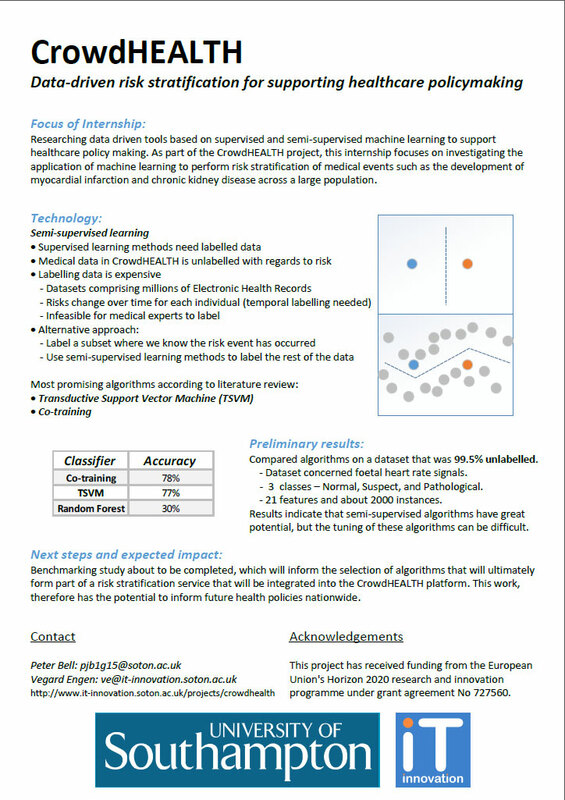 As part of the CrowdHEALTH project, this internship focuses on investigating the application of machine learning to perform risk stratification of medical events such as the development of myocardial infarction and chronic kidney disease. 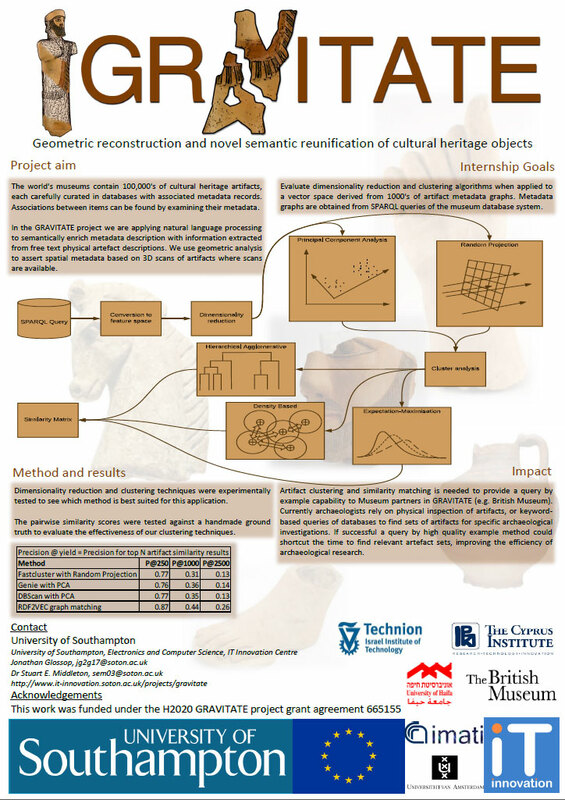 Exploring the use of dimensionality reduction and cluster analysis in the GRAVITATE project for computing the similarity between 1000's of cultural heritage objects. 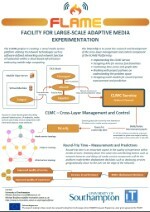 The poster provides a description of one of the major components in the FLAME media service platform, namely the Cross-Layer Management and Control component (CLMC). 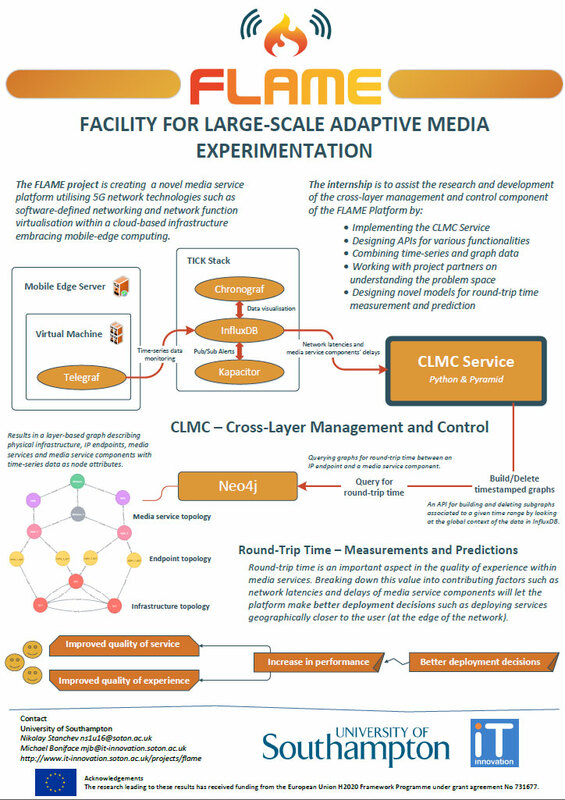 The main focus is put on the CLMC Service which combines time-series and graph data to create a novel model for measuring, predicting and analysing round-trip time between media service components and IP endpoints. 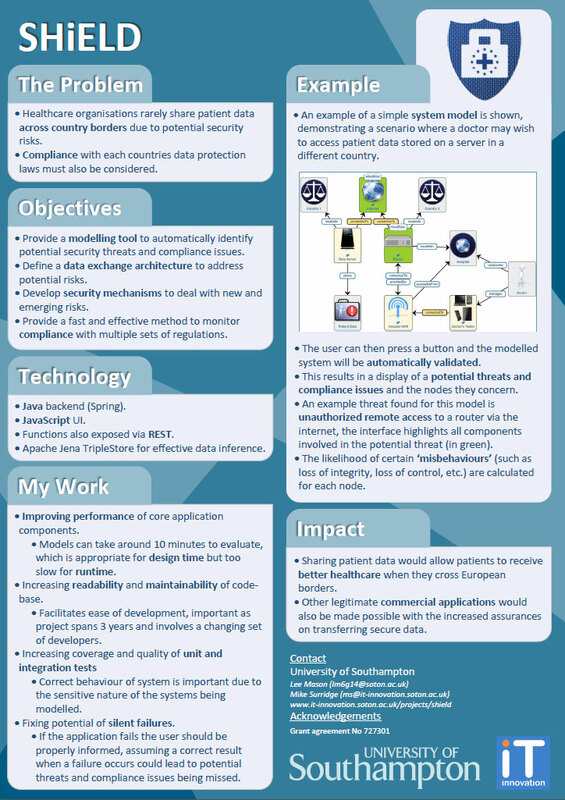 This poster outlines the RestAssured project’s impact on data protection and details the testing framework being used to bring our software up to a commercial standpoint. 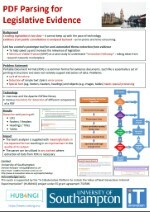 Advantages and disadvantages of this approach are also presented, both in the context of the project and outside it. 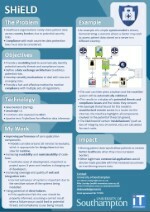 A poster outlining the RestAssured project, its impact in many different use cases and the contributions from IT Innovation. 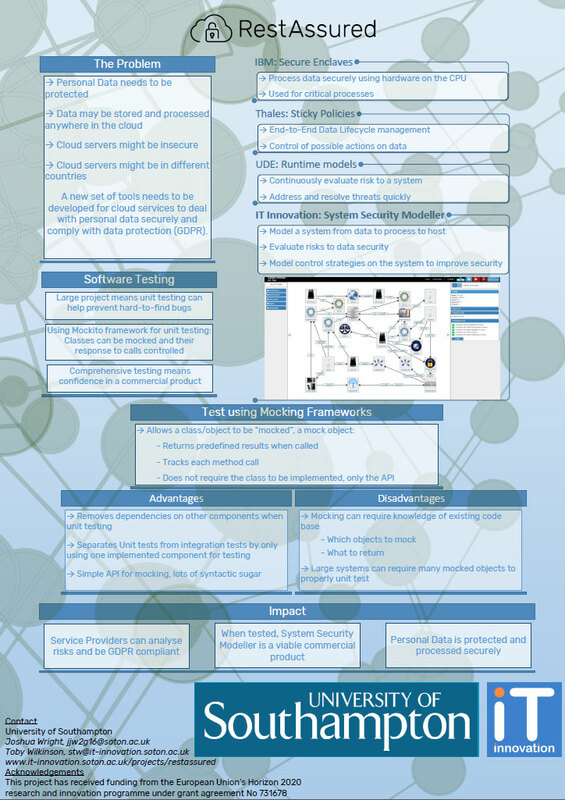 It includes a detailed screenshot of the System Security Modeller and explains the technology that goes into the tool that is essential for modelling threats that apply to a system. 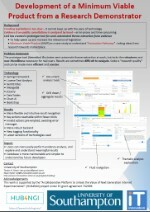 An overview of the Software Engineering aspect of HUB4NGI project, outlining the broader context and the technologies involved in developing a theme extraction and sentiment analysis tool (SENSE4US) and the challenges faced while improving its quality and reliability; it also presents screenshots of some of the key features of SENSE4US. 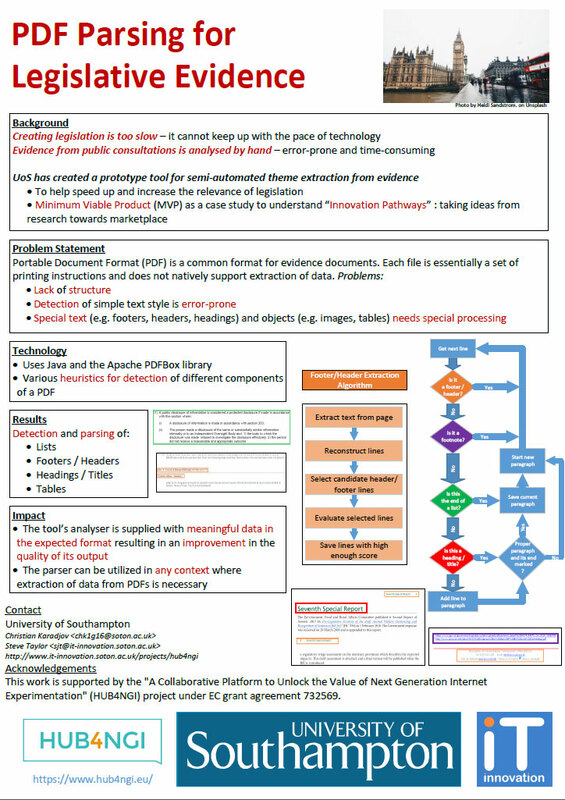 The poster is about a PDF parsing tool which extracts meaningful text in the form of paragraphs and sentences while ignoring irrelevant information such as footers and headers, footnotes, headings, etc. 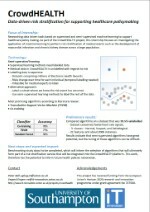 The purpose of the parser is to feed properly formatted relevant data to the SENSE4US tool which can then perform qualitative analysis on it, facilitating the creation of legislation.